The film is an intimate portrait of Hina, a mahu (transgender) woman and cultural legend in Hawaii who teaches Hawaiian language, history, and culture. She finds a surprising candidate to lead her school’s all-male hula troupe: Ho’onani, a sixth grader who is proud to be seen as a mixture of boy and girl. As Kumu (teacher) Hina helps Ho’onani negotiate the mixed reactions of her classmates and her family, the power of culture to instill a sense of pride and acceptance becomes clear. We spoke with Hawaii-based filmmakers Dean Hamer and Joe Wilson about how they first came across Hina, what younger generations can learn from this story, and things that surprised them while making the film. Kuma Hina premieres on PBS tonight, Monday, May 4, at 10pm (check local listings). How did you first learn about Hina, and what made you want to make a film about her? We spent 2005-2009 producing and then conducting an extensive grassroots community engagement tour with our first PBS documentary, Out in the Silence, which focused on the discrimination and brutality faced by a teenager who came out as gay at his small town high school in Pennsylvania. Everywhere we went, we heard similar stories of the difficulties faced by LGBT youth, especially in rural and small town America. Then in 2010, we visited Hawaii to present the first Out in the Silence Award for Youth Activism to the Gay Straight Alliance at Farrington High School, a large public school in inner-city Honolulu. We arrived at the school to find a gymnasium full of 2,000 raucous students, mostly from Pacific Islander families, being led in cheers by an ebullient young person we immediately recognized as transgender: someone Hawaiians refer to as mahu, one who embodies both male and female spirit. Unlike the typical narrative across the continental U.S., where openly transgender students face rejection, brutal bullying, and violence, this cheerleader was at the center of popularity in her school. We were stunned, and deeply curious about what made such reactions seem not just possible, but normal in Hawaii. So when our Hawaiian friend Connie Florez, who became a co-producer on the project, told us that she was very close with a mahu woman who was a respected teacher and community activist, we were eager to meet her. That was how we first encountered Hina Wong-Kalu, known affectionately in the community as Kumu (or teacher) Hina, over dinner at a local restaurant. By the time we got to dessert, we knew we just had to make a film about this immensely regal yet down-to-earth woman, and the culture that surrounded and embraced her. How did you gain Hina’s trust? Was she reluctant to tell her story? At first Hina was pretty skeptical, but she warmed up when we told her that we hoped to make a film that wasn’t just about “the transgender issue” but about the challenges of living and perpetuating Hawaiian culture in modern day society. A film that wasn’t just about Hawaiians but for them, and that told the story through the characters’ own voices, not an outside narrator or academic “expert.” The trust between us grew as we continued to film Hina and the other characters, including Hina’s husband Hema, and her amazing young student Ho’onani, day in and day out, with respect and integrity. Talk a bit about your plans for educational engagement that go in tandem with the film, including what A Place in the Middle is. As a result of the strong response we received at live screenings, especially from educators enthralled by the way Hina’s school treats students across the gender spectrum with dignity and respect, we decided to make a shorter, kid-friendly version of the film that tells the story from Ho’onani’s point of view, plus colorful animation. The resulting film, A Place in the Middle, premiered at the Berlin International Film Festival K+ Competition, and recently appeared at the Toronto International Film Festival for Kids. In order to make this resource accessible to teachers and other professionals working to make their schools and communities welcoming and inclusive for all, we’ve made A Place in the Middle available for free on its website and on PBS LearningMedia, along with a downloadable teaching guide and other materials. 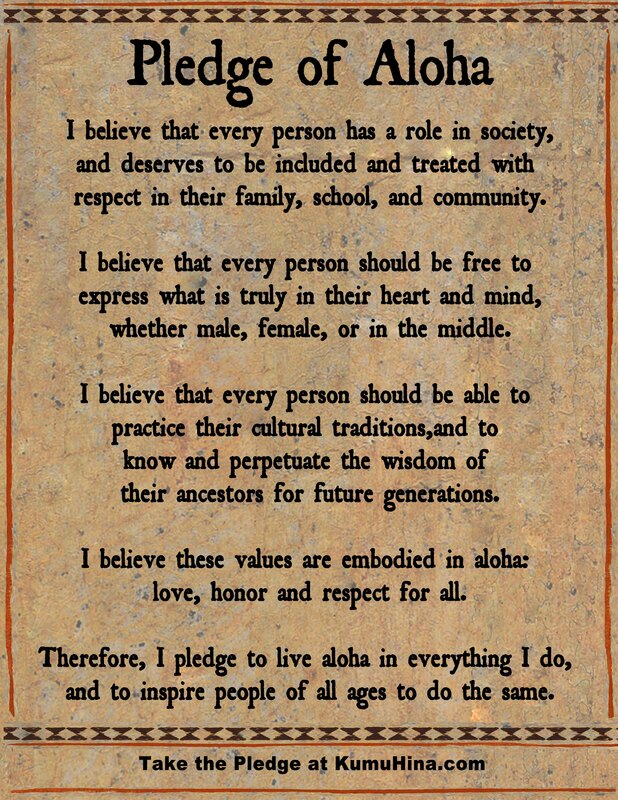 As part of this educational campaign, we’re also asking people to stand-up to take and share the Pledge of Aloha, which viewers will understand from the emotional scene in the film where the principal at Hina’s school reminds the students of the importance of holding on to one’s own culture. The more people take and share the #PledgeofAloha, the better chance we have of seeing this Hawaiian model for gender diversity and inclusion being replicated across the U.S.
Can you give us any updates about Ho’onani, who is such an important part of the film? Ho’onani is now a freshman at Farrington High School, of all wonderful places, and she’s doing great. In fact, we were invited to do a Kumu Hina screening for the student body there not too long ago and her peers treated Ho’onani like a movie star, asking for her autograph and to take selfies with her. It’s not yet clear who Ho’onani will grow into, but she has the support of her family, school, and community to pursue whatever dreams she has in her heart. We’re confident that we’ll see her dreams, whatever they may be, come to fruition as she continues to follow her muse and to shine her light as an bold and independent person. Do you think the Bruce Jenner story will make people become more familiar with and accepting of transgender people? How does that story help push the conversation forward? Despite the way the Bruce Jenner story was rooted in America’s fascination with salacious, celebrity-driven journalism, it was a breakthrough of sorts, in the same way that the revelation that Rock Hudson was gay helped humanize a previously very marginalized segment of society, one that most people thought was simply not a part of their lives. Perhaps the most surprising aspect of the story was Jenner’s revelation that he identifies as a conservative Republican, a group that has been consistently intolerant and disrespectful of transgender people and their needs. In the past, Republicans might have felt that they didn’t need to worry about transgender people because they didn’t even know any. But now they do – and s/he’s one of them. Likewise, we hope that when viewers see that there is an entire society and culture that accepts and even embraces transgender people, it will open their hearts and minds to a more inclusive point of view. Was there anything that particularly surprised you in the making of the film? Like many if not most Americans, we tend to think that we have the solutions for every problem, and that if other people would just listen to us, all would be well. Wrong! When it comes to gender diversity, Hawaiians have a far more sophisticated understanding than we do, and use that knowledge for the benefit of the entire society. It’s a model we would do well to emulate. Learn more about Kumu Hina.